Invisible Zipper Foot – Is It The Same As The Standard Zipper Foot? The invisible zipper foot is not the same as the standard foot. 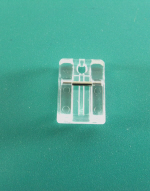 This foot is designed to provide a genuinely concealed closure for garments and accessories. The foot looks different and works differently than the standard zipper foot. What are some of the differences between the invisible and the standard zipper foot? For one thing the invisible foot is used with the zipper open, and the right half of the zipper is placed under the right groove of the foot, the left half of the zipper is placed under the left groove of the foot. This is opposite of how the standard zipper foot works, which is designed to sew the right half of the zipper from the left side of the foot, and turning the fabric to sew the other side of the zipper with the same side of the foot. Another difference is that the zipper is sewn to the garment before any other stitching is done to the seams. Another difference is that the zipper is actually sewn with right sides together, right side of zipper to the right side of the fabric, and it is the fabric that is turned to conceal with zipper, once the stitching is done. The zipper is really considered invisible because there is no stitching showing on the right side of the fabric, because the fabric has been folded to the inside of the garment.